Plus Size Kitten: Body Shop Sale! 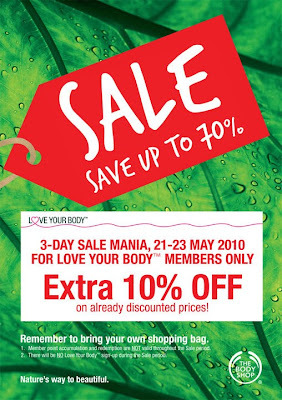 Thanks to a reader Jamie, she sent me information on the products that will be in sale for the Body Shop Sale. You may refer to the poster below for the items on sale. Do note to check the manufacturing/expiring date also color and scent of the products before finalizing your purchase. to be continue, now lunch time. ooo...finally it is here again. i have been waiting for this! That's really nice of you for the reminder to check the manufacture date. I always forgot to do so. is it everywhere or just one outlet? Still can go buy it without any membership? but actually easily overcome this obstacle.. just go to the shop, ask one of the customers there if u can use her membership to purchase items.